It has been a while since our last front-page post and, as readers of our build-roll thread are aware, we have been busy. With the official internal beta now underway, the process of shoring up Command‘s functionality and content for the v1 release is in full swing. One of the brand-new additions in Build 349 is range-symbols for non-friendly units. Compared with earlier attempts at implementing this feature in other titles, enemy range-rings in Command are not a “magic” piece of intelligence provided to the player; instead, they are based solely on the information obtained through the player’s assets. The more accurate a contact’s identification status becomes, the more information about the contact’s abilities can be provided on the map. In this notional strike ingress scenario, an F-117A is attempting to penetrate an air defence screen and strike a fuel bunker. 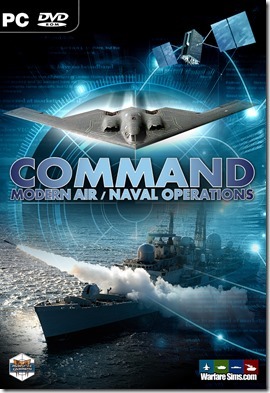 It is aided by an RC-135 electronic snooper, an invaluable asset in such an operation. The fixed SA-3 site has been automatically detected at the start of the scenario, so its precise location and identification are known. This allows the friendly “staff” to plot its maximum missile range (red circle) and maximum radar range (very large white circle) with confidence. Note that, to avoid confusion with friendly range symbols, enemy symbols are drawn with dashed lines instead of solid. Like friendly symbols, they can be merged to remove visual clutter. There is, however, an extra pop-up threat which is detected by both aircraft, south of the SA-3 site. Preliminary identification points to a SAM element, and a “Straight Flush” radar emission is detected and identified. Gut instinct points to a SA-6 battery, but the EW operators are not yet confident enough for a positive ID (which would also allow for plotting a missile range circle). The detected radar, however, constitutes a detection threat by itself, so it is plotted (medium white circle) immediately. Notice that the contact’s location is still quite uncertain, so the radar’s actual coverage can very significantly; this is an important consideration for the player. If another-longer range radar emission is detected from the same contact, the circle will grow accordingly. 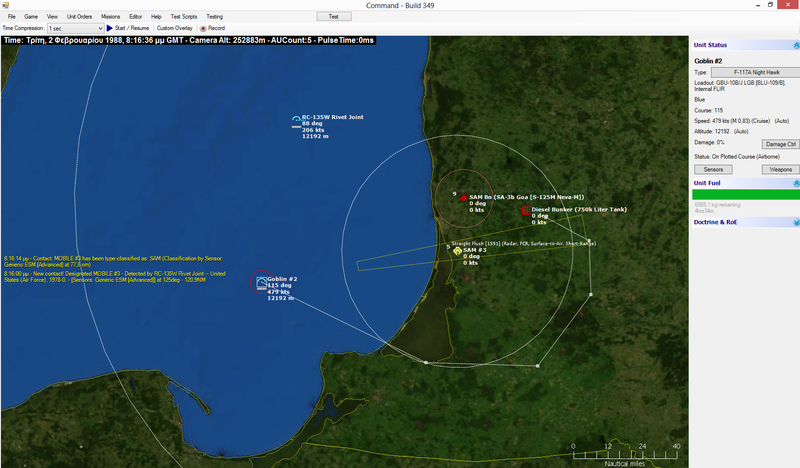 Based on this visual information, the player plots the penetration route depicted in the screenshot, trusting that it will keep the aircraft out of the dangerous engagement radar and, for as long as possible, hopefully out of detection range of the SA-3 battery as well. If the pop-up SAM battery’s location is subsequently narrowed down to a point east of its current estimate, the route will likely have to be revised. Out next demo is a hot item… in more ways than one.